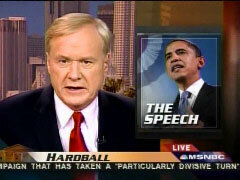 On Tuesday night's "Hardball", Chris Matthews praised the current Democratic frontrunner's speech on race as "Worthy of Abraham Lincoln," and also claimed it bypassed Martin Luther King Jr.'s "I Have A Dream" address as the "best speech ever given on race in this country." Of Barack Obama's speech in Philadelphia today, Matthews went on to declare: "I think this is the kind of speech I think first graders should see, people in the last year of college should see before they go out in the world. This should be, to me, an American tract." CHRIS MATTHEWS OPENING THE SHOW: A divide as American as the Grand Canyon, a speech worthy of Abraham Lincoln. Let's play Hardball! MATTHEWS: Did Barack Obama distance himself enough from Reverend Wright? Did he calm the fears of the white voter? How did the speech play? We'll have much more on this momentous day and what I personally view as the best speech ever given on race in this country. One that went beyond "I have a dream," to "I have lived the dream but have also lived in this country." MATTHEWS: Let's all listen now to a bit of the speech. We should all, by the way, at some point after the program, please wait for the end of "Hardball," at least. But check this out on our Web site, MSNBC.com, you can watch the whole speech. I think this is the kind of speech I think first graders should see, people in the last year of college should see before they go out in the world. This should be, to me, an American tract. Something that you just check in with, now and then, like reading Great Gatsby and Huckleberry Finn. Read this speech, once in a while, ladies and gentlemen. This is us. It's us with the scab ripped off. It's white people talking the way they do when they're alone with other white people, some people. It's black people talking the way they are when there's not white people around. It's an honest statement from a guy who comes from both backgrounds. We have never heard anything like this. MATTHEWS: We'll talk about the politics of all this and whether voters will be convinced, by what many of us think is one of the great speeches in American history and we watch a lot of them, when we return. You're watching "Hardball" only on MSNBC.